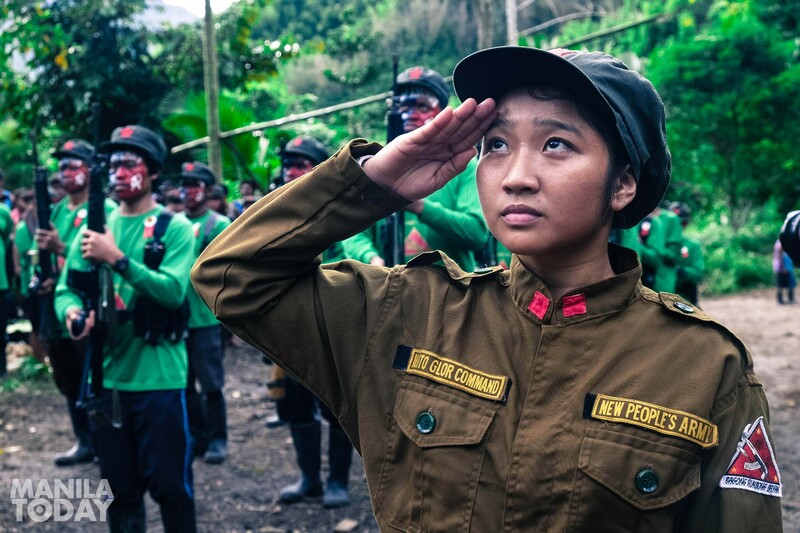 Ka Kathryn of the Melito Glor Command, New People’s Army. Photo from Manila Today. Cadres of the NPA are very much aware of the sacrifices and struggles when engaging in conflict. Experience within such war is, of course, not pleasant. Seeing your fellow comrades fall down and get killed in the middle of combat is shocking — worth grieving, even. But Ka Erick gives us a different perspective on the struggle in the midst of People’s War. One that put him in a situation which was hard to overcome, and is ever-present so long as the forces of the reactionary government continue to fight against the movement of the masses. This story of Ka Erick talks about how he has overcome the tortures and the sufferings while under the hands of the police and the military. It talks about struggling with fear, and how he took it, and bravely overcame this with all his passion and dedication to serve the People’s War. As Ka Erick tells it, almost every time, whichever armed force performs a tactical offensive against the other, seizing the initiative, it is usually the former that outnumbers the latter and are able to take over the area. As a result, the day Ka Eric was captured, him and his comrade, knew what they were likely greatly outnumbered. They knew that this time, it would be hard to combat the military. His thoughts were never far from what transpired in this offensive by the military. The military was able to totally surround the area. Not only were they numerically outnumbered, fully-equipped, with Kevlar suits and helmet. They even had a helicopter. Even so, the NPA fighters bravely stood their ground and fought. The aftermath was devastating. From around 30 in the platoon, only about 7 were alive. Ka Erick says that there was even overkill, given that some cadres tried to surrender, but were still killed by the soldiers. Ka Erick was one of the few that was, perhaps, lucky enough to be captured instead of being killed in action. While the military continued to engage, Ka Erick ran down towards the farm fields, rifle in hand. From here, he shot a soldier on the head. But, given that the soldier was wearing a bullet-proof helmet, he was able to survive. This soldier came to be the person who tortured him the worst, Ka Erick related. After this, he was caught and was brought to prison. His days in prison were days of pain, suffering, and fear. He was often tortured by army personnel. Both physical and psychological abuse. These tortures were different in form every time. Sometimes, a group of military personnel would punch him in the stomach for as long as they could. Ka Erick says that this is what they often do, given that when hit in the stomach, it usually leaves no bruises, and hence no sign of any abuse. This was used to interrogate him — being asked questions and being hit at the same time. Ka Erick says during all of these tortures, no medical assistance is ever given to him or any of his fellow cadres. Often, they are tortured to the point that it is so painful, but not too much for them to die. They are just usually left alone after being tortured. Physical abuse was not the limit of the tortures inflicted on him while he was in the hands of the military. Sometimes, Ka Erick would be blindfolded and be forced to walk a long distance. Other times He would be brought to a vehicle and be dropped off by soldiers somewhere, and one of them would place a sharp object on his throat. The soldiers would then laugh and give him death threats, “kapag sinalvage natin ‘to dito, walang makakakita at walang makakaalam! Itatapon na lang ‘yan sa ilog pagtapos!” (If we killed him here, no one will be able to see and no one will be able to know! We could just throw him off the river afterward!) They would say to Ka Erick, thus raising fear and torment in his mind. Even if he’s now free from the walls of the prison, those tormenting days left physical scars that he carries. Worse, it left mental scars that cannot be forgotten, ones that cannot be healed even after the entire lifetime of Ka Erick. Ka Erick could have had the chance to lie low and stay in the city for a different life after he was free from the hands of the military. However, he still chose to serve the people and the revolution. It was hard for him — after deciding that he would go back to the People’s Army. He did not know how to go back and serve. He tried returning to the mass organization where he was recruited, but the members had left or lied low, for various reasons. In the long run, Ka Erick didn’t find that as a big hindrance. He tried to look for different mass organizations, and he was able to be organized again. Soon thereafter, he went back to the People’s Army to continue serving the people and the revolution. He says that he would always, always, find a way to get back serving the people in the highest form of struggle, as long as he lives. This dedication in serving the people is a reason to look upon Ka Erick with admiration. His selfless decision is something that not every one of us can easily make, let alone devote oneself towards in the long run. “Fear is a natural response of a person. Every single one of us experiences fear. But it is up to you as to how you will handle fear from then on.” This is how Ka Erick explained how he sees fear. For him, he didn’t let fear envelop him. He handled it instead and used it to strengthen himself and to serve the people, as always. During our time as militants, it is inevitable, he said, that we struggle with fear in times of war and revolution — this is that is ever-present: We will face fear. But, we can use it to push ourselves further towards the revolution. Ka Erick was also asked by one of the visitors about why he still continues to fight and struggle for liberation, even after all that had happened to him. He answered — with clear conviction — that he fights because he knows that the cause of the NPA, guided by the Party, is just and worth struggling for. For Ka Erick, he plans to fight and struggle until his last breath — as long as he is physically able to do so. Regardless of all the difficulties, the tortures, and the fear that he faced and will face in the future, he has decided to make the bold promise that he will fight for the masses, as this is the long fight that will truly liberate the Filipino masses from oppression and the root causes of poverty. For us here within the walls of the city, we also face the strikes and blows of fascism. While agitation from the social realities pushes us further to fight, there are also times that we lie low, and sometimes even choose to stay quiet, because of fear. However, as Ka Erick says, fear is a natural reaction of a person. Every single one of us experiences fear. So, in times when we struggle with fear, it is essential to stop and assess ourselves. Let us reflect on the reasons why we made the decision to serve the people in the first place. We must realize that we face fear during our days of activism and militancy primarily because of the fascist attacks of the state. Ka Erick, when he was tortured, was certain of who the real enemy was. He knows that it is the state that tries to instill fear within him. And only struggling along with the masses for national democracy will truly liberate him, alongside us, from this form of fear that the fascist state uses to terrorize the revolting masses.